Need to brush up on your singing or guitar playing? Too embarrassed to sing karaoke in front of a live audience? Is Rock Band not stimulating enough for you? Here’s a little solution that might do the trick. Download a MIDI file of the song by searching the web. Cool MIDI and Midi Database are good places to start. 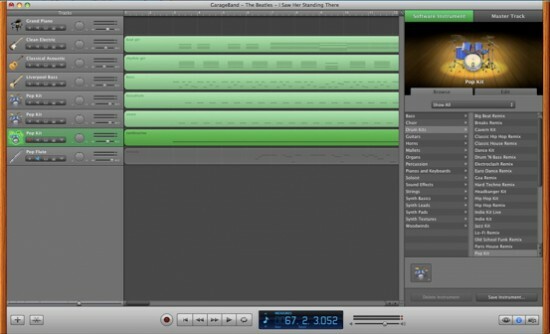 Open a new Garageband project then click on “Loops.” Locate the MIDI file you downloaded and drag it onto Garageband where it says “Drag Apple Loops here.” You will see each track appear on the left-hand side, and if you’re lucky, each track should already be assigned to their respective instruments. Now, all you have to do is mute the part you would like to sing or play over, do a little bit of tweaking, and you’re ready to go. Some MIDIs, however, assign each track to Pop Flute by default. If this is the case, proceed to the next step. The best way to do this would be to “solo” each track by clicking on the button with the headphones on the track panel, and then listening to each one carefully. Once you’ve identified the instrument, click on the “i” button on the bottom-right corner to find the corresponding software instrument. Be sure to check the regions as some of them already tell you what instrument they’re supposed to be assigned to. You can easily find song lyrics or guitar tabs with a quick online search. Now that wasn’t too hard, was it? All you need is Garageband from the iLife suite. of about musiic compared to what I have learned with dance.